Jenny of ELEFANTZ: A day with Wendy...and a free design! A day with Wendy...and a free design! 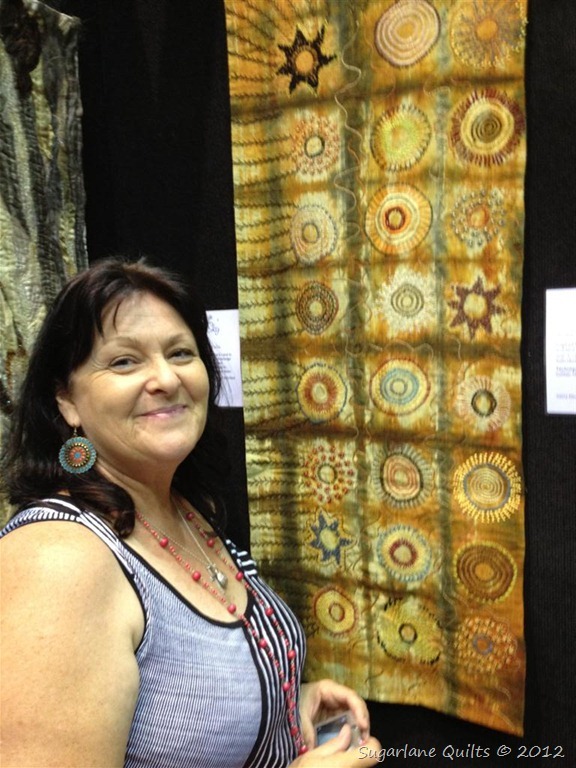 Yesterday my mate Wendy and I spent the day wandering through the Townsville Craft & Sewing Show at the Entertainment Centre. The day began with Mr E and coffee by the beach, then he left us girls to our own devices (and our credit cards - eek!!) for a day of browsing, laughing and of course, shopping. I missed the Show the last couple of years, so it was good to get out and see new products being demonstrated, and have the opportunity to pick up some nifty bargains in the process. My plan was only to buy what I would use, so if it didn't have a purpose then I couldn't get it. Great theory, and actually, I pretty much stayed on course with it - though there were a few tiny impulse purchases! So I'll share some photos of our day, ok? Fun was had ALL day long! I met Jenny King, a crochet designer, who got me so inspired by her work that I came home with a hank of variegated silk to crochet a scarf! So what did I eventually come home with?? I thought perhaps you may have a friend who'd like to receive a similar gift, so I am sharing the design free from today. 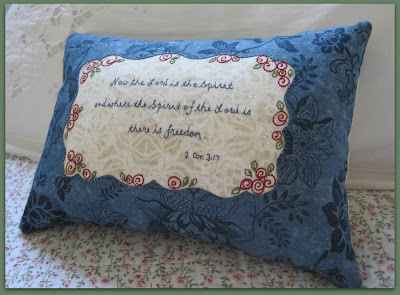 You can download the "Freedom" pattern HERE. Have a wonderful weekend! We're getting ready for our favourite race of the year, the Bathurst 1000!! Hopefully we'll see this guy win again! Lovely! And thank you for the freebie! looks like a great day out, so many lovely things to see. The pin cushion is far to nice to stick pins into! There is nothing nicer than a craft show with a friend. Great day and great photos....We are 'Craig' fans here too! I saw bins of buttons!!!!!!!!!!! What gorgeous things -- handmade crafts and all of the goodies to create them. That shawl on display is stunning. You have come home with a very Jenny-looking haul of gorgeous goodies, now I will love to see what you make with it! Well you and Wendy did have some fun and what lovelies you picked up. I just love the little crochet dress. So glad that you two girls had so much fun. HI JENNY, I really love your stuff. Am making the borders and promises wall hanging for my granddaughter for xmas, but I love it too. I would love to come to Australia, it has always been my dream vacation and the craft show you were at looked great. I'm so glad you two had such a good time, sweetie - and thank you for the darling design!!! Isn't it a blessing to share a wonderful day with a true friend. What great photos of your friend-fun! I'm envious. =) Thank you so much for the pincushion design. That is perfect for something I have to make for a Christmas swap, right down to the blue color! Lowndes at least was on the podium with his team mate. I am a Jamie Whincup fan, Craig Lowndes follows then Shane Van Gisbergan ( not sure of the spelling. )I was screaming the last 7 laps for poor Jamie running low on fuel. Vodophone team really are masters of their sport. Do you like Craig's new look car? Looks like you came home with some beautiful things. Lovethe new look blog too. Great race indeed!! I'm a Jamie fan too, so was happy with the outcome. Craig's car was 'dressed' as a Brock car to celebrate 50 years of Bathurst. It will be back to normal next race. I watched Brock with my dad when I was growing up so there was a bit of deja vu during the race.